Elkhorn Trading Company - FIRESTARTERS //////////////////////////////////////////////// Firestarters work on theold concept of "flint and steel" The body of the firestarteris made of deer antler with a round bar of industiral flint embedded into it. 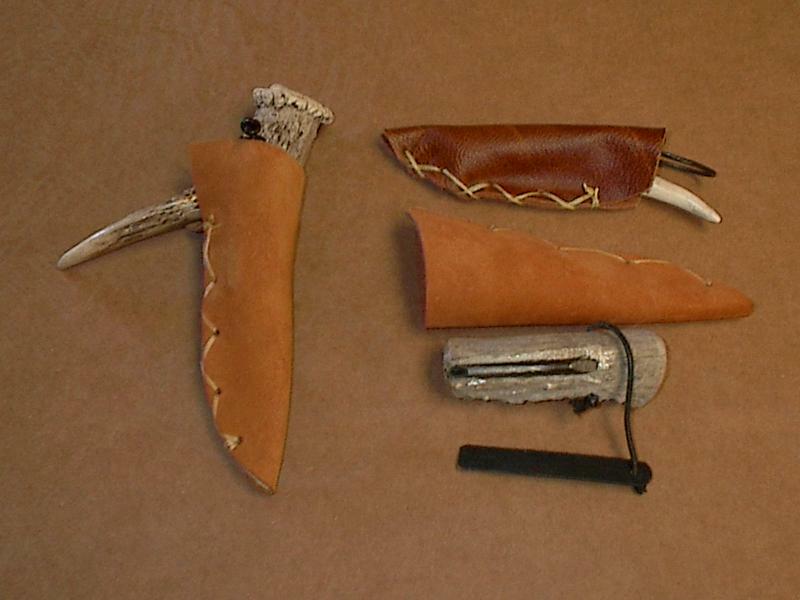 A small piece of flat steel bar is attached, used to scrape against the flint, causing a spark, which ignites the fire.And fits into a leather sheath. Starting a fire, with this item is a VERY SIMPLE process. Place the edge of the striker against the flint bar, on the indoard end, with the top edge of the striker tilted foreward about 45 degrees, then scrape the striker foreward, with HEAVY pressure. Hold the firestarter close to the tender, so the spark will penetrate the tender and ingite, into a flame. Many items in the field can be used as tender. Fine, dead grass, pine needles, frayed cedar bark, and cat tail fuzz will work. Household items, such as very fine steel wool, cotton balls, the frayed out end of a hemp rope, or dryer lint [ from the clothes dryer filter ] . Dryer lint is by far the most practical material to use. It's trash, thrown away often, and it ingites easily. Simple fire starting proceedure ....... pull apart a ball of dryer lint [ about the size if a golf ball ] and build a "tee-pee". out of small twigs, on top of the lint. Light the dryer lint, the twigs will ignite, add larger sticks, and your fire is going ! The firestarter works well for the camp fire, trail ride, deer lease, motor home, ski lodge, outdoor grill, fireplace in the den, .......or anywhere . old concept of "flint and steel"
is made of deer antler with a round bar of industiral flint embedded into it. A small piece of flat steel bar is attached, used to scrape against the flint, causing a spark, which ignites the fire. And fits into a leather sheath. Starting a fire, with this item is a VERY SIMPLE process. Place the edge of the striker against the flint bar, on the indoard end, with the top edge of the striker tilted foreward about 45 degrees, then scrape the striker foreward, with HEAVY pressure. Hold the firestarter close to the tender, so the spark will penetrate the tender and ingite, into a flame. Many items in the field can be used as tender. Fine, dead grass, pine needles, frayed cedar bark, and cat tail fuzz will work. Household items, such as very fine steel wool, cotton balls, the frayed out end of a hemp rope, or dryer lint [ from the clothes dryer filter ] . Dryer lint is by far the most practical material to use. It's trash, thrown away often, and it ingites easily. "tee-pee". out of small twigs, on top of the lint. Light the dryer lint, the twigs will ignite, add larger sticks, and your fire is going ! The firestarter works well for the camp fire, trail ride, deer lease, motor home, ski lodge, outdoor grill, fireplace in the den, .......or anywhere . Capable of creating fire in any weather condition, climate or location. Works well for campfire, barbeque grill, fireplace or wood burning stove. Lasts 4,000 strikes. Firestarters - Standard, Medium, and Decorative Sizes shown here.